Rosie is Secretary of the Algarve Branch of the Mediterranean Garden Society. The Society is a not-for-profit organisation which fosters interest in gardening in the Mediterranean climate regions around the world. Her own garden, a two hectare site situated in the eastern Algarve, is a wonderful example of natural planting which makes the most of native plants cleverly supplemented with species from other Mediterranean regions. In this truly low maintenance garden much of the work consists purely of maintaining natural paths which also act as firebreaks. In the spring a carpet of dazzling wildflowers (including many native orchid species) enrich the scene and the garden is a year-round magnet for wildlife. 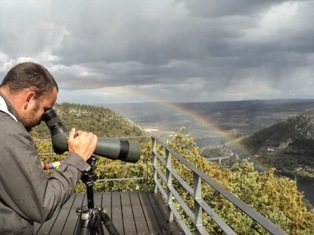 Thijs is a well-known bird photographer and volunteer with organisations concerned with the conservation of birds and other wildlife in the Algarve. Among the organisations he works for is RIAS - Centro de Recuperaco e Investigacao de Animais Selvagens - based at Ria Formosa Nature Reserve. This privately funded resource may be small in size but punches well above its weight for the wildlife of the Algarve by caring for sick and injured birds and animals rescued and delivered to them for nursing before returning them to the wild. 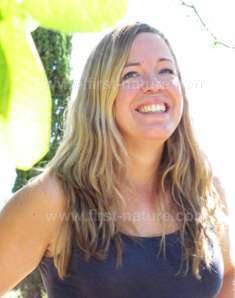 Marilyn Kahan runs Water Wise Gardening, a company specialising in sustainable gardening in the Algarve. Marilyn has been interested in gardening for most of her life, having been encouraged from childhood by two gardening-mad grandmothers. 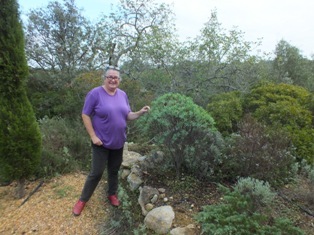 She is best known in the Algarve for her pioneering work as Head Gardener at the Hapimag Resort near Albufeira, where she moved having gained the RHS Certificate in Horticulture and a BSc in Landscape Management. The challenge at Hapimag was to convert the conventional garden, consisting of large lawned areas and subtropical planting, into the owners vision of something that was less expensive to maintain and more environmentally sustainable. Although grass and subtropical plants can survive the tough Algarvian climate they require vast amounts of water throughout the summer months when temperatures can soar into the mid-forties C. Marilyn’s solution has been to create a naturally beautiful landscape using native Algarvian and other drought-tolerant Mediterranean plants. The Hapimag garden has become a must-visit destination for those interested in sustainable solutions to the problems of gardening in the Algarve. Professor Bernd Gerken is the owner of Haliotis, an area of land in a remote valley situated on the border between the Algarve and southern Alentejo. He is a world-renowned Professor of Ecology who contributes to conservation projects in many countries, and who is in great demand as a speaker at international environmental and conservation events. His project at Haliotis involves the remediation of land devastated by earlier unsustainable agriculltural and forestry exploitation, and to manage it in such a way that it can once again support the creatures, including mankind, which depend upon it for their survival. Bernd is also a well-known artist. 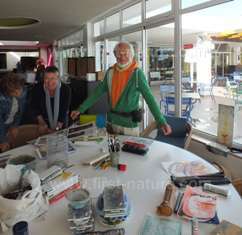 His work is exhibited in several local galleries, and he runs art classes at the Hapimag Resort west of Albufeira in the Algarve. 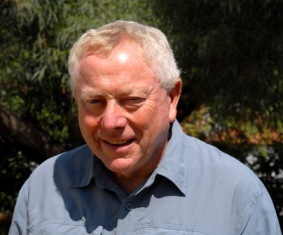 Clive Viney is the author of Algarve Wildlife - the natural year. He is also the author of The Birds of Hong Kong and South China, which is available in English and Chinese and is the standard regional guide. First published in 1977 it is now in its eighth edition. Clive, a keen naturalist, spent most of his working life in Hong Kong where, as a trustee of World Wide Fund for Nature Hong Kong, he was editor-in-chief of their magazine About Life. 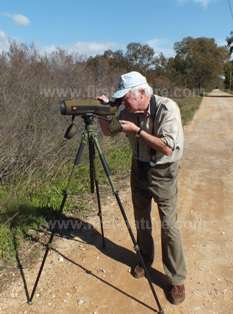 Ray Tipper is co-author of Algarve Wildlife - the natural year. A life-long birdwatcher, Ray began his birding on the North Kent Marshes at the age of eleven. He left Britain in 1973 spending most of the next 22 years in Hong Kong. As a trustee of WWF he was intimately involved with its renowned Mai Po Marshes Nature Reserve. It was in Hong Kong that Ray turned to bird photography, which quickly became his major interest. Having gained associateship of the Royal Photographic Society in 1990, his photographs appear in journals and books throughout the world.